More comedy bits, more skits, more blackouts, more funny lines, more complete presentations and more humorous bits of business. 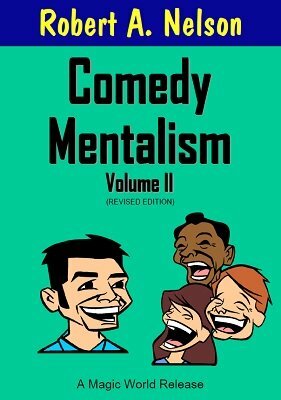 Volume 1 of Comedy Mentalism was such a success that Nelson did "what comes naturally," and assembled a whole stable of comedy writers (many new to this series) and proudly offers Volume 2 of Comedy Mentalism . This is funny stuff! Contains comedy bits and new humorous situations for every occasion. Bits for MC's, amateur shows and every possible professional entertainment occasion. NEW COMEDY AND EFFECTS by Bob Nelson, "Senator" Crandall, Tommy Windsor, Lois Lytle, Dorny, Bob Heidinger, Dr. Faust (David Hoy), Syd Bergson, Karrell Fox, Gerald Kosky, The Amazing Maurice, Oran Dent, Alan Milan, George Johnstone, Ray Muse, Larry Nelson, Sid Lorraine, North Bigbee, Bob Parrish, Bob Lynn, The Amazing Whitney, and Dave Dowds. Volume 2 will convulse your audience with shrieks of laughter, and give you many a hearty chuckle as you read its many funny, funny pages. The writers have come up with some excellent comedy situations, many of which are worth more than the price of the entire book. You will participate in many actual humorous experiences of real mentalists when you read the chapter "It Actually Happened." And you'll want to present "Mystic Mary," a hilarious skit from the team of Lois Lytle and Bob Nelson. "Senator" Crandall will bring tears of laughter to your eyes as he explains the ESP symbols. Yes, a goldmine of comedy, PLUS a BONUS of (serious) PSYCHIC GEMS - four in all, included here, too! And that's not all. Magic World, publisher of this revised and expanded edition, has included a second bonus section containing even more gags, one-liners and bits of business. Bob Parrish raves: "I really enjoyed the Comedy Mentalism books. You did a fine job of selection as well as obtaining fresh material." K. Thompson notes: "A true offbeat take on mentalism that is encyclopedic in nature [with material by] many contributors who Robert Nelson 'mentally influenced' into giving up their routines." The New Tops says: "Mentalism is both a science and a performing art and it doesn't have to be stuffy. If you're looking for something to liven up the stuffy act, ask your dealer for one of the volumes in the Comedy Mentalism series." 1st edition 1963; revised digital edition 2017, 116 pages.